My first experience creating a cashew cream--every vegan's dessert delight--was surprisingly easy, successful, and tasty. 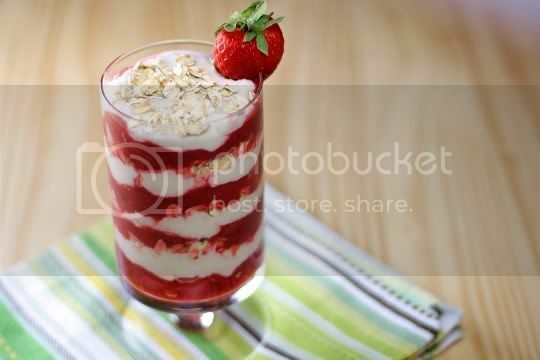 Rich, creamy, and coconutty, it's combined with a fruity strawberry-rhubarb mixture for a gorgeous parfait-like treat. You'll be amazed at how easy this is to make, although I do include a few recipe notes, the main one being this all needs to be made at least a day in advance! To create the cashew cream, simply add RAW (not salted or roasted!) cashews to a food processor and blend until completely ground into a thick powder. A standard food processor will do this (although it might be slightly grainy), but if you've got something of the VitaMix quality, you'll get a much nicer and smoother consistency. Next, add a can of coconut milk, sugar, and a little vanilla, and whirl until smooth, thick, and rich in consistency. I used a 14-ounce (not a 15-ounce) can of unsweetened coconut milk. Don't use a "light" version, as the cream won't set how it's supposed to. Basically when you open the can, there should be a thick and solid layer of coconut oil, with the thinner milk at the bottom (you may found this sold under the name of "coconut cream," just make sure it's unsweeteneed, and don't use "cream of coconut"). Don't worry about the consistency; it will all be taken care of in the food processor. Refrigerate the cream at least overnight; you want it to be thoroughly chilled and thickened. Also, the flavor seems to be richer the next day. 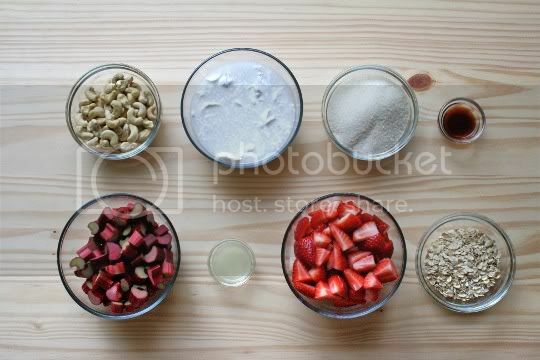 To make the strawberry-rhubarb mixture, simply cook diced rhubarb, sugar, and a little lemon juice until the rhubarb is softened. The rhubarb may look prone to burning since there won't be much liquid in the pan, but don't worry, it will quickly start releasing juices. 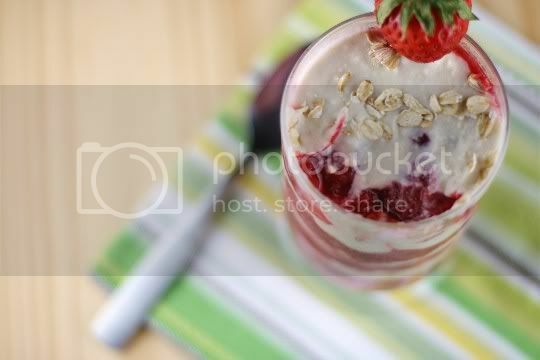 Next, add fresh strawberries and cook for an additional few minutes, remove from the heat, and stir in a little vanilla. The end product should look a bit like thick strawberry jam. Let all of this cool, then refrigerate overnight. A note about the fruit amounts. The recipe calls for 3 cups of diced rhubarb (or three stalks), but I found that my three stalks only yielded about 2 1/2 cups...so buy a couple extra stalks just in case (you can always freeze it for a later use). And while the strawberry amount is also 3 cups (or two pints), I actually found that a little over one pint was all I needed. 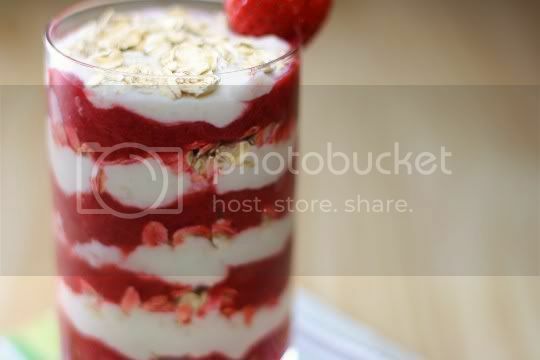 To serve, simply layer your chilled cream and fruit in a parfait glass, with a layer of toasted oats in between. So easy, yet so glamorous! The coconut cashew cream isn't overly sweet, but the texture is amazing and you'll find it hard to believe that there's no dairy in it. And you don't even taste anything cashew-y: you really only taste the coconut flavor, which is such a delicious pairing with the tangy and sweet fruit mixture. 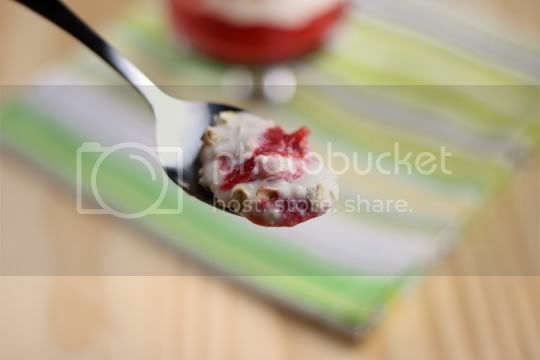 The toasted oats add some chewiness and heartiness, and combined, it's like eating a sophisticated version of berries and cream, or a thick fruit pudding...so yes, that makes it perfect for breakfast or dessert. Make again? Yes. Proof that non-dairy desserts can be just as rich and fabulous! Oh my goodness, I've been looking for the right recipe to try rhubarb and this is it! When I go to the market next week I will certainly be picking up some rhubarb so I can try this out. It looks simple, and it's vegan, which is perfect so I won't need to sub-out non-veg items. I love your blog, check mine out if you'd like (also vegan) :)! Oh wow, this looks SOO good! I love rhubarb and are always looking for new ways to use them- this is such an great idea! This looks fabulous - what a fantastic way to highlight the fruits of the season. And I love a good cashew cream. Thanks for the recipe!